The largest firebowl I’ve done to date is the 53 inch diameter Meridian Sculptural Firebowl™ installed on the 6th floor pool deck at Allure Waikiki. 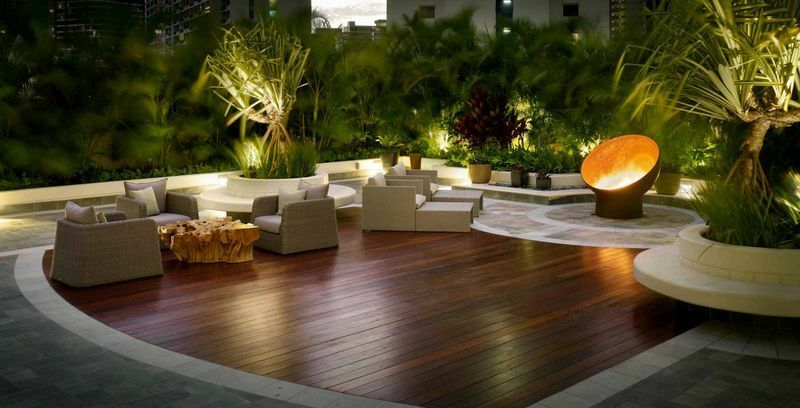 I absolutely love the above photo by Eric Staudenmaier and how it captures the glow of the fire on the teak deck. If Eric were based in Hawaii rather than LA, I’d absolutely hire him to shoot all of the other firebowls installed in hotels throughout the Hawaiin Islands! This firebowl was quite a challenge to make, ship and have installed really— it weighs around 600 pounds and required a crane to put in place. Here’s a video I shot before shipping it that shows the relative size of the 53 inch firebowl next to a standard 37 inch Meridian firebowl. I also posted a video on my Facebook page that shows the crated firebowl being lifted into the freight truck with a bobcat. If you’re into that kind of thing.